Being a hero isn’t actually that difficult. It takes but a single decision. With that mindset Blizzard created Open Division—global Overwatch tournament leading to the pro league. 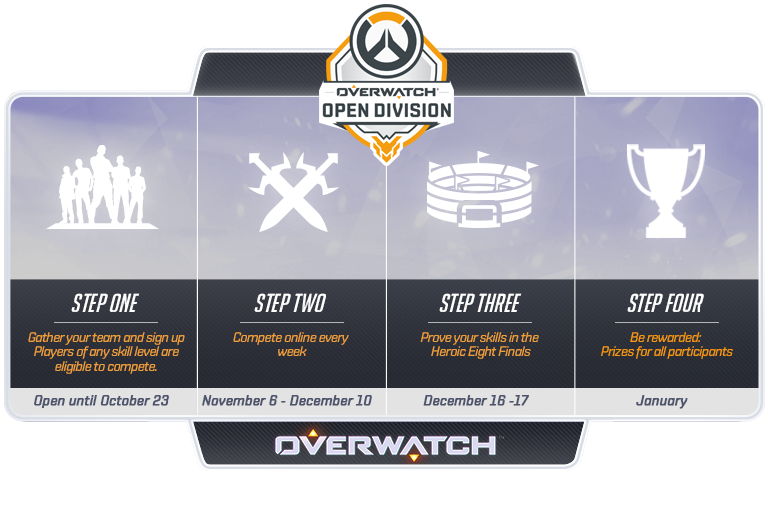 The next edition of Open Division starts on August 17th and will last for a month, until September 15th. Thousands of teams from around the world will compete until only four are left standing. These four will then test themselves against the Contender, a proper Overwatch pro players. If they any of them wins, they will join their ranks and keep playing. The tournament takes place entirely online and is a friendly affair. There isn’t much in the way of prize, although the Contenders themselves play for millions of $. So in a truly Blizzard fashion, you have to compete for the chance to compete in a competition to win real money. Still, not the worst way to spend a couple of weekends with your friends, if playing in a highly competitive environment is something you like. Then again you’re playing Overwatch, so everything is a competition.